zarinahtakesapaycut: Datuk Seri Tony Fernandes - Be warned. “@taizeehow: Tony fernendes made a lord ???" Commander of the British Empire. V prestigious UK award. This is Johan Raslan's style. Being the crook that he is, he has started tweeting again as if nothing is wrong. Datuk Seri Tony Fernandes will do well to be wary of this chap. For a start, Johan Raslan has praised him on his twitter account. The best defence against Johan Raslan is to not touch him even with a ten foot pole, which will be our recommendation to anyone, including Datuk Seri Tony Fernandes. Datuk Seri Tony Fernandes should be aware that Johan Raslan's own staff are 'spitting' on him, and are sending vital information on what's what to the outside world. If this is the reality of the world that Johan Raslan is occupying right now, his tweets are trying to paint a picture that is the exact opposite, but it will take more than simple bluster to fool the world this time. To get an idea of what Johan Raslan is capable of, we will point in the direction of two of his better known 'victims'. Johan Raslan is the man who did a number on Tun Musa Hitam. Even though Tun Musa is a wily politician himself, Johan Raslan still managed to take him for a ride when he wanted to. If anyone wants further details, they can call Tun Musa directly and get the story. Tun Musa Hitam, a wily politician himself, underestimated Johan Raslan's mind. And why did Raja Tan Sri Dato' Seri Arshad step down as the Chairman of PwC? Once again Johan Raslan managed to pull a fast one on someone who is way more accomplished than he is. Raja Tan Sri Arshad, another victim of the nefarious mind of Johan Raslan. We will give an example of how Johan Raslan can place ethics below everything else when it comes to personal benefit. 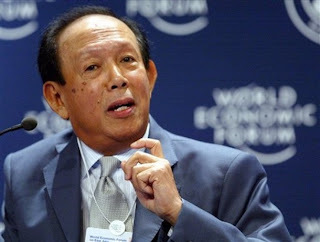 He knowingly signed on as the majority shareholder and as a Director of PricewaterhouseCoopers Consulting Sdn Bhd (464379-U), at Chin Kwai Fatt's behest, even though by doing this, Johan Raslan knew he was becoming party to the fraud. But the lure of becoming the Chairman pf PwC was too great for him to worry about silly things like ethics and professional standards. He has also been privy everything else that has been going on, especially with Chin Kwai Fatt in the picture, but chose to 'buat bodoh'. At one point he was even dreaming of becoming the next Chairman of the Securities Commission, a possibility that is all but destroyed right now, thankfully. "Government appointments: Board member of Putrajaya Corporation; member of the International Advisory Panel of the Labuan Financial Services Authority ('LOFSA'); member of the Securities Commission of Malaysia's Corporate Governance Consultative Committee; board member of Kumpulan Wang Persaraan (Diperbadankan) ('KWAP'). He was previously chairman of the Malaysian Financial Reporting Foundation ('FRF'), the body which oversees the Malaysian Accounting Standards Board. During his tenure at FRF, the decision was made to converge Malaysian accounting standards with International Financial Reporting Standards by 2012. All this has past, but we sincerely hope that a true entrepreneur, who deserves every accolade for enterprise and business acumen there is, like Datuk Seri Tony Fernandes, will be forever protected from the influence of those like Johan Raslan and Chin Kwai Fatt. May their shadows never fall anywhere near our country's best and brightest.